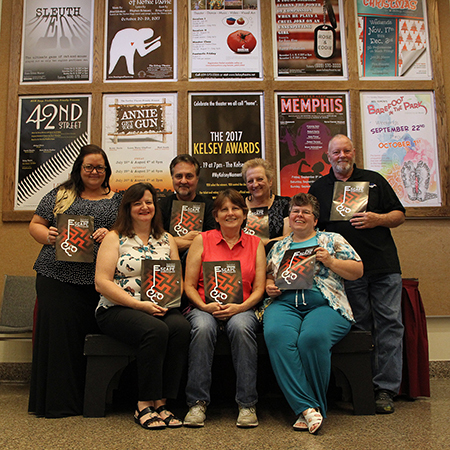 Staffers prepare for Kelsey Theatre's 44th season, which starts Sept. 8 with with "Memphis." Seated, from left, are Diana Maurer, Kate Pinner and Amy Bessellieu; top row, from left, Lyndsey Goehrig, Dan Spalluto, Artistic Director M. Kitty Getlik and Mike Almstedt. West Windsor, N.J. – Mercer County Community College’s (MCCC’s) Kelsey Theatre invites theater goers of all ages to escape to the theater for this year’s line-up of hilarious comedies, serious dramas, family and adult musicals, and shows for the younger set. Artistic Director M. Kitty Getlik and all the staff at Kelsey Theatre are preparing to bring up the curtain on a blockbuster 44th season. Kelsey Theatre is located on MCCC’s West Windsor Campus, 1200 Old Trenton Road. In keeping with the college’s goal to offer high quality, affordable theater for all, ticket prices are a fraction of those at larger venues, with subscription packages available for discounts of up to 43 percent. Series packages for new subscribers go on sale Aug. 15; tickets for all individual shows go on sale August 21. (Current subscribers may renew now.) Unless otherwise noted, tickets for musicals are $20 for adults, $18 for seniors, and $16 for students and children; tickets for plays are $18, $16, and $14. (There is a small surcharge for processing of orders.) Orders may be placed by calling the box office at 609-570-3333, by mail, or online (starting Aug. 21). For a complete listing of adult and children's events, visit the Kelsey website or call the box office for a brochure. The mood turns wondrously festive with Irving Berlin’s timeless “White Christmas,” presented by M & M Stage Productions Nov. 17 to Dec. 3. Other family events for the holiday season are “Twas the Night Before Christmas,” presented by The Kelsey Players Dec. 8 to 10 and “The Nutcracker,” a performance by New Jersey Youth Ballet Dec. 15 to 17. The music continues in 2018 with another blockbuster of Broadway and film. Presented by PinnWorth Productions Jan. 5 to 21, the title cannot be announced quite yet. Let’s just say, “Something's coming, something good!” (Tickets are $20 for all.) Next up is a comic adaptation of a 1930s hit film. Ken Ludwig’s “Twentieth Century,” about romance aboard a train bound for Boston, will be presented by Theater To Go Jan. 26 to Feb. 4. The whole family will enjoy “HONK! The Musical,” based on The Ugly Duckling fable by Hans Christian Andersen, presented by The Yardley Players Feb. 9 to 18, with a special daytime performance for groups Feb. 16. For anyone who loves dogs and has ever considered filling their empty nest with one, “Sylvia,” presented Forte Dramatic Productions May 11 to 19, will hit just the right touching and amusing notes. Emotions of a darker sort are on display in “Glengarry Glen Ross,” as ruthless real estate salesmen battle for supremacy by lying and cheating. David Mamet’s modern classic is presented by The Pennington Players May 25 to June 3.